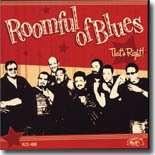 Veteran jump blues band Roomful of Blues has gotten their groove back, witnessed by their new CD, That's Right!, for Alligator Records. It's our Pick Hit this month. The record company calls it a "rock" album, but Etta James' upcoming release, Let's Roll, proves that she can still sing the blues. Her latest is this month's Surprise pick. Blues pianist Rosco Gordon never received the recognition he deserved as one of the pioneers of both Rock'n'Roll and Ska music. A look back at his early Sun recordings is this month's Flashback feature. This month's What's New section includes a couple of new releases from Phoenix area bands Cold Shott and the Hurricane Horns featuring Small Paul and Honeyboy Dupree & the Smokehouse Players, as well as new CDs from Sugar Ray and the Bluetones, Ray Bonneville, George Thorogood, The Legendary Shackshakers, The Allman Brothers Band, and Dave Hole, plus exciting reissues from the works of Albert King and Reverend Gary Davis.